The price of gasoline and how much we consume are common topics of conversation around the globe and particularly in Canada. We thought it was time for an oil company to contribute to the discussion. Welcome to Petro-Canada’s PumpTalk blog. One of the things I do to keep my sanity when I commute is to celebrate the little victories: someone unexpectedly letting me merge, the line at the drive-thru coffee place not having a 10-car wait and not hitting every single red light on my way from my house to the highway. This last one is really the unicorn of commuting events - it almost never happens. And, like a lot of you, I think to myself as I'm sitting at the umpteenth red light in a row, "We can put a man on the moon; why can't they just sync these lights up?" Well, it turns out they CAN sync them up. 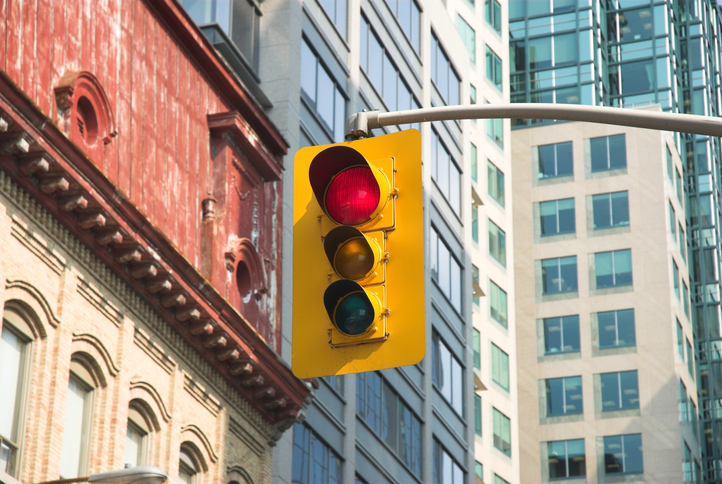 The City of Toronto is piloting two traffic light systems that use different implementations of artificial intelligence to adjust traffic signals in real-time, ideally reducing congestion, idling and ultimately, emissions, during peak use hours. One of Toronto's pilot systems uses video cameras to measure car queue lengths at the approach to an intersection and then makes decisions about traffic light timing. The other system uses radar detection that measures traffic flow upstream and downstream of the intersection to make similar decisions. Toronto's pilot program started in November 2017 and is expected to run through 2018. The City has not made results available yet, but the systems being tested are similar to a smart traffic light system that was implemented in Pittsburgh, Pennsylvania in 2012. Since the initial implementation, Pittsburg has been increasing their smart intersections over the last few years to a total of 50 intersections, with another 150 planned by 2020. So far, Pittsburgh has seen intersection wait times fall by 40%, journey time fall by 25% and emissions from idling cars on these commutes reduced by 20%. This video features an interview with Stephen Smith, Director of the Intelligent Coordination and Logistics Laboratory at Carnegie Mellon University, where the smart traffic light system in Pittsburgh was first developed. What do you think? If you're in Toronto, have you driven the route where these traffic lights are in place? Have you noticed an improvement in your commute? Would these work in your city? Let us know in the comments! PumpTalk is a blog created by Petro-Canada, a Suncor business, to share information and engage in discussion about a number of topics, such as fuel efficiency and product responsibility. In our weekly posts, we discuss subjects that we believe are important and are of interest to drivers everywhere. Here you’ll find posts on gas prices, reducing fuel costs, sustainability, auto industry innovation, and vehicle safety and maintenance, as well as posts on climate change as it relates to the energy industry and our shared responsibility. Subscribe to PumpTalk via email. You can unsubscribe at any time by clicking the "unsubscribe" link in any PumpTalk email you receive. Robin Veerman on Tell Us Your PumpTalk Ideas for 2019! Alexandra Lemay on Tell Us Your PumpTalk Ideas for 2019!